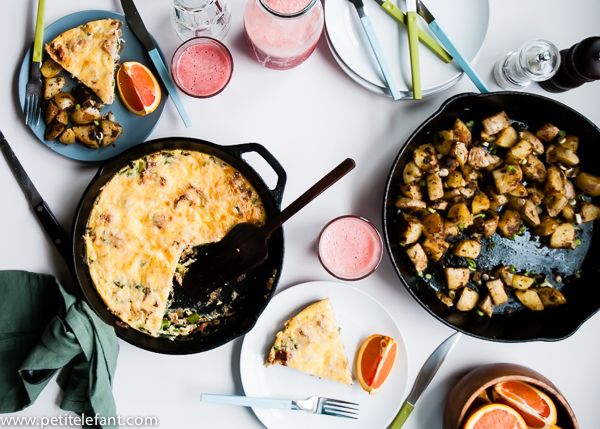 Easter Brunch is one of my family’s favorite meals to share together. 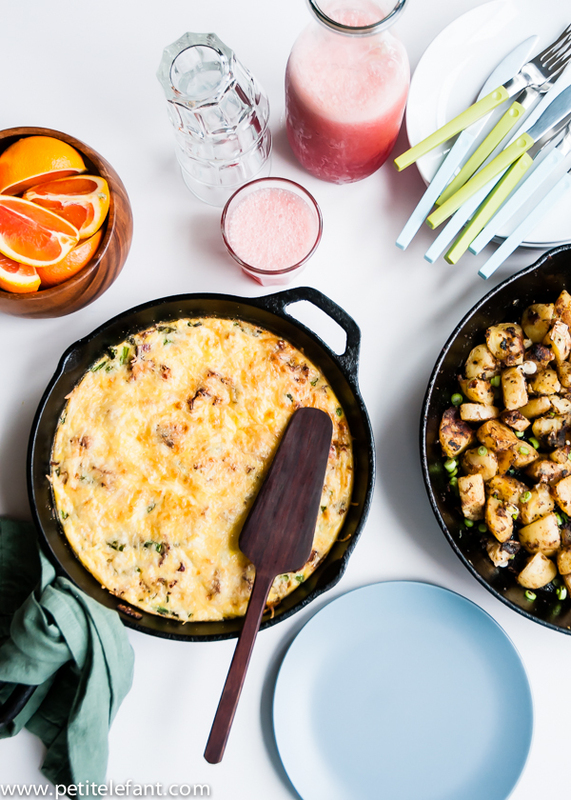 We’re big on breakfast foods at our house and especially when it comes to egg dishes like omelets and frittatas. And especially when it comes to a good asparagus recipe. Asparagus goes very well with eggs and bacon. This is one of those brunch recipes that is also delicious for lunch or dinner. 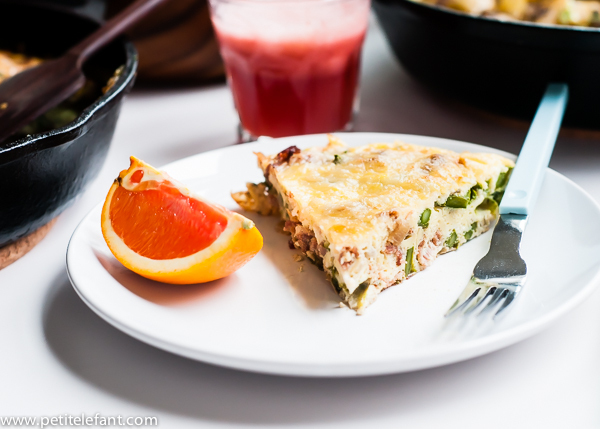 This asparagus bacon frittata is very savory and satisfying. I served it up with a side of home fries browned up in a little bit of the bacon drippings. I don’t buy bacon very often, so when I do, there are often cheers heard ’round the house – “bac-on! bac-on! bac-on!” And then the sneaking starts. One piece here. A nibble there. I can’t blame the poor kids. Bacon is mighty tasty. And this woudn’t be an asparagus bacon frittata without it. When it comes to cheese, you want to use a stronger one that holds up to the flavor of the bacon and meshes well with the asparagus. I used an four cheese Italian blend this time. Usually I go with gruyere which is one of the greatest cheeses EVER. Mozzarella is nice and mellow, but lacks a little in the flavor department. A nice aged cheddar would also go well here. 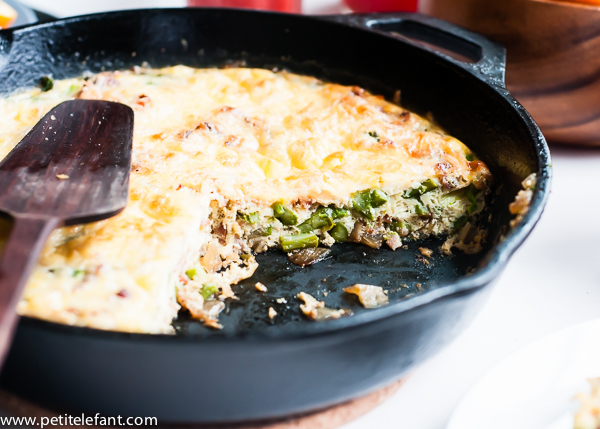 A good frittata is made from tender crisp veggies and eggs that are neither overcooked or too runny. It should be set up enough to slice into wedges. It’s not quite as custardy as quiche, but almost. Because it’s already pretty rich, I used low-fat milk instead of cream. 1. Preheat oven to 350 degrees F. Cut the tough ends off the asparagus and discard. Cut the trimmed asparagus into 1/2-inch pieces. Set aside. In a medium bowl, whisk together eggs, milk, thyme, garlic powder, salt and pepper. Set aside. 2. Heat an 10-inch cast iron (or another oven safe) skillet over medium-high heat. Add the bacon. Cook, stirring often, until bacon is nicely crisped. Remove from pan with slotted spoon and drain on a plate lined with paper towels. Pour off all but 1-2 Tablespoons of the rendered fat. 3. Add the onion to the pan. Cook for 5-10 minutes or until it softens and starts to turn golden. Add the asparagus and cook for 1-2 minutes. Turn off heat. Sprinkle the bacon evenly over the vegetables. 4. Pour the beaten egg mixture over the other ingredients. Tilt pan so eggs are evenly distributed. Sprinkle the cheese over the top. 5. Place the pan into the oven. Bake for 20-15 minutes, or until the top has puffed up and the cheese starts to turn golden. Remove from oven and let cool for a few minutes before cutting into wedges and serving. Lindsey Johnson can usually be found in one of three places--the kitchen (cooking and washing dishes), behind her camera, or at her laptop editing photos and writing. If she's not in any of those places, chances are she's chasing after her three crazy kids or scoring a great find at the thrift store. She writes the food blog, Cafe Johnsonia and lives near the beautiful mountains in Utah with the aforementioned three crazy kids and one great husband.